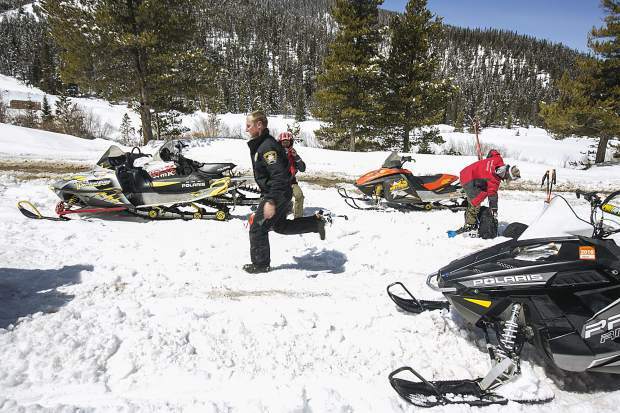 Summit County Sheriff officer Brian Metzger, center, and Summit County Search and Rescue team prepare to head out to the avalanche incident site at Georgia Pass Tuesday, April 10, near Breckenridge. A pair of snowmobilers triggered an 800-foot wide avalanche near Georgia Pass Tuesday morning, killing one and prompting a rescue effort involving more than 30 people, two dog teams and a helicopter. It was the second Colorado avalanche death in just three days, underscoring the current danger of large, destructive slides despite generally moderate avalanche risk. The man fatally buried in the slide was found and dug out of 4 feet of snow roughly an hour and a half after the initial report came in at 11 a.m. His cause of death was unclear at the scene and is pending investigation, a rescue spokesman said. The Summit County Coroner’s Office has not yet released his identity. The slide occurred between the Middle Fork of the Swan River and Georgia Pass east of Breckenridge. It grew rapidly, spreading 800 feet wide and traveling more than 2,000 feet. It triggered another slide as it ran, and the two merged, Summit County Rescue Group spokesman Charles Pitman said. The Colorado Avalanche Information Center is set to investigate on Wednesday and will prepare a complete report on the slide. CAIC rated avalanche conditions as moderate on Tuesday, the second risk rating on a scale of five. That’s a general average for an entire area, however, and experts still urge backcountry travelers to be wary in slide-prone terrain. Tuesday’s avalanche occurred on an estimated 37-degree slope angle, Pitman said. Slopes steeper than 35 degrees are most prone to slide, making for a dangerous combination with recent storms that dumped several feet of snow at high elevations. Pitman noted that another avalanche was reported during the rescue near the Eisenhower-Johnson Memorial Tunnel, but there were no burials. “That just goes to show how the snow conditions are pretty tender right now,” Pitman said. CAIC deputy director Brian Lazar said that the Summit County area is currently experiencing several avalanche problems, all exacerbated by the recent snowfall. The route to the slide path runs through difficult terrain, so the investigation into the avalanche will begin Wednesday. A Flight For Life helicopter came from Eagle County to deposit dog teams from local ski areas near the base of the avalanche. “A dog located the victim fairly quickly and they managed to extricate him fairly quickly, but he was found to be already deceased,” Pitman said. The slide was called in at 11 a.m., and a dog located the man at 12:37 p.m., Pitman said. Rescuers dug him out in roughly 10 minutes. Tuesday’s death came just three days after another avalanche death in Pitkin County. On April 8, a pair of backcountry skiers left Aspen Highlands Resort through a gate and triggered an avalanche while ascending through an area known as Maroon Bowl. One of them, John Galvin, was killed. His body was recovered Tuesday morning. Galvin was a beloved, 30-year veteran of Mountain Rescue Aspen.